New York Rangers goalie Henrik Lundqvist greets Washington Capitals goalie Braden Holtby after the Rangers won 2-1 in overtime in Game 7 of the Eastern Conference semifinals on Wednesday in New York. UPDATE (May 14, 7:28 a.m.): Game 7 between the Rangers and Capitals on Wednesday night featured more top-notch goaltending from Lundqvist (35 saves) and Holtby (37 saves). The Rangers won 2-1 — every game in the series was decided by one goal — and both goalies beat their combined save percentage for the series. Who says low-scoring hockey games are boring? The New York Rangers’ Henrik Lundqvist and the Washington Capitals’ Braden Holtby have put on a heart-stopping and spectacular goaltending duel in Round 2 of the Stanley Cup playoffs, which will conclude with Game 7 in New York on Wednesday night. So far, every game in the series has been decided by one goal, with Lundqvist and Holtby combining for a 1.80 goals against average (GAA) and a .943 save percentage. How to measure goaltending success is a subject of debate among hockey geeks. But here’s one approach, which is inspired by Baseball Prospectus’s Support Neutral Win-Loss (SNWL), a statistic designed to evaluate baseball pitchers. As SNWL seeks to evaluate pitchers while controlling for their run support, our goalie statistic will seek to give goaltenders credit for wins and losses without being biased toward those goalies who have better offenses scoring goals for them. It will also control for the number of shots the goaltenders faced and the quality of their opponents. Allowing three goals — as Lundqvist did Sunday — is not that impressive, but it looks a lot better when you consider he faced 45 shots against the Capitals, who have one of the NHL’s best offenses. Here’s how it works. I downloaded data from Hockey-Reference.com on all NHL playoff games since 1988. (Hockey-Reference, as terrific as it is, doesn’t have detailed game-by-game data before then.) For each game, I compared each goalie’s actual GAA against a benchmark GAA that represents how you’d expect an average playoff goalie to perform under the same circumstances. The benchmark GAA is calculated1 based on the number of shots the goalie faced, his opponent’s goal-scoring and shooting percentage during the regular season, and whether he was playing at home or on the road. During Friday’s Game 5, for instance — with the Rangers playing at home and the Capitals generating relatively few shots — Lundqvist’s benchmark GAA was 2.17. But on Sunday, on the road and with the Caps taking 45 shots on goal, his benchmark GAA was 3.56. In the chart, MP/60 stands for minutes played divided by 60. Since a regulation NHL game is 60 minutes long, it essentially just means games played, although goalies will get extra credit for games that go to overtime.5 The next column shows the goalie’s net change in win probability per 60 minutes played. Multiplying this number by MP/60 produces net wins — how many wins a goalie added or subtracted from his team relative to an average playoff goalie. That’s what we use to hand out Roys. So the Roy for best goaltending in a single playoff series goes to… Tim Thomas of the Boston Bruins, for his performance in the 2011 Stanley Cup Final against the Vancouver Canucks. The Canucks had been the NHL’s highest-scoring team in the regular season and launched more than 35 shots per game at Thomas. And yet he allowed only eight goals in the seven-game series, including a shutout in the final. Thomas is followed by his fellow Bruin, Tuukka Rask, who allowed just two goals against Sidney Crosby and the Penguins in the 2013 Eastern Conference finals. 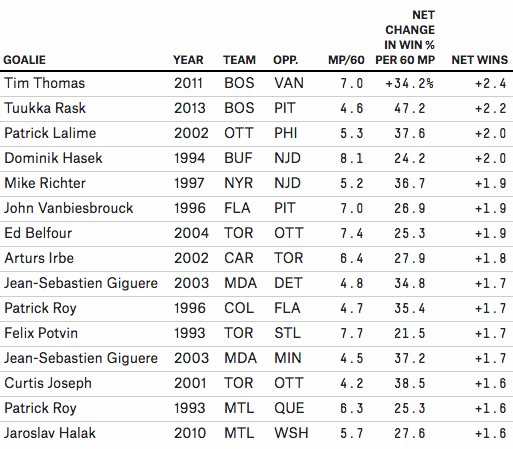 He was even more effective than Thomas on a per-shot basis, with a .985 save percentage. Perhaps he was too good for his own good, in fact — the Bruins swept the series, so he played substantially fewer minutes than Thomas. In third place is Ottawa’s Patrick Lalime, who allowed two goals in five games against the Philadelphia Flyers in 2002. 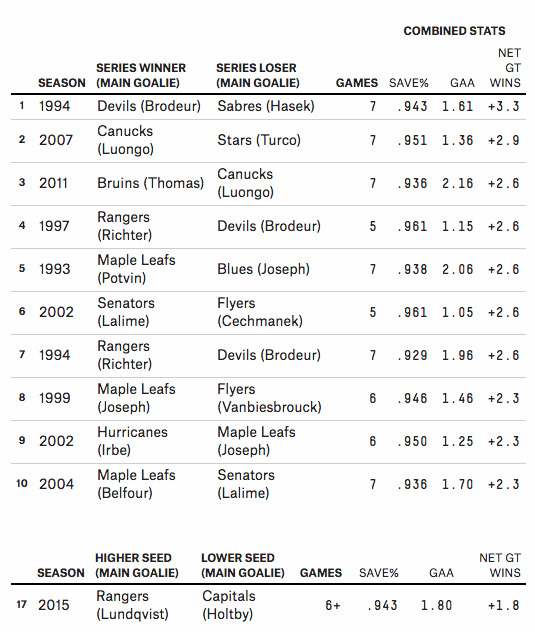 Why does that Devils-Sabres series rank so highly? Hasek and Brodeur’s conventional statistics were great, but not obviously better than some other goaltending duels, like that between the Canucks’ Roberto Luongo and the Dallas Stars’ Marty Turco in 2007. One reason is because of that quadruple overtime game, which made the matchup the equivalent of an eight-game series. But another is because the series was played in 1994, when goal-scoring was about 20 percent higher than it is now. So it stands out more by comparison. The current Rangers-Caps series ranks as the 17th-best goalie duel so far: Holtby has contributed 1.0 net wins and Lundqvist 0.8, for a combined 1.8. It could plausibly move into the top 10 if Game 7 is low-scoring. We can also award a Roy for the best goaltending in a single playoff season. It goes to … Patrick Roy, who added 4.2 wins in the 1993 NHL playoffs. Roy’s performance ranks highly in part because it came against some high-flying offenses. His playoff opponents — the Nordiques, Sabres, Islanders and Kings — had each averaged about four goals per game during the regular season. Most of the Roy winners in this category comport well with the conventional wisdom. Four of the top six goaltenders — Roy in 1993 and 2001, Thomas in 2011 and Jean-Sebastien Giguere in 2003 — also won the Conn Smythe Trophy for being the MVP of the NHL playoffs. 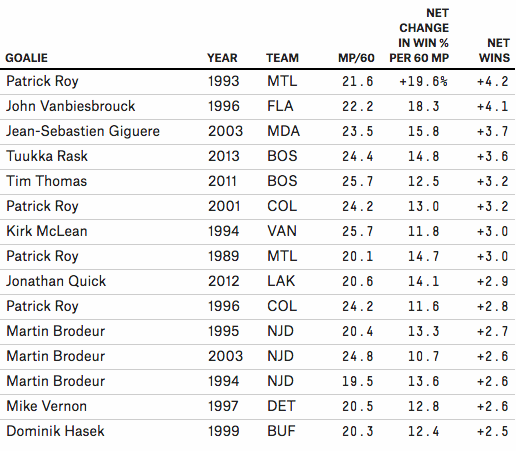 Finally, the Roy for the best lifetime playoff performance goes to … Patrick Roy. From 1988 onward, Roy was 15 wins better than an average playoff goaltender, easily outdistancing second-place Ed Belfour. And that under-rates Roy, since it doesn’t give him credit for 1986, when Roy, then 20 years old, had a 1.92 postseason GAA in leading the Canadiens to the Stanley Cup. Roy also does really well by conventional playoff statistics — he had 151 career playoff wins, easily the best all-time — but he earned them. In other cases, however, the advanced stats provide some insight that isn’t as clear from traditional stats. While Brodeur had a considerably better career playoff GAA than Roy, for instance, he’s relatively far behind him in net wins, since the Devils’ neutral-zone trap prevented him from facing all that many shots and since he played in a low-scoring era. Meanwhile, the Penguins’ Marc-Andre Fleury ranks as the third-worst playoff goaltender since 1988 despite a winning (53-44) career playoff record. That’s because it’s easy to win games when you have Crosby scoring goals for you. Our support-neutral stat detects that Fleury really hasn’t been much good in the playoffs. Lundqvist, meanwhile, ranks as the sixth-best playoff goaltender since 1988, while Holtby ranks ninth — despite being in just his fifth NHL season. After Wednesday night, one of them will have the chance to add to his legend, while the other will have plenty of time to watch Patrick Roy clips on YouTube. Via a linear regression analysis. Win probabilities are calculated using a Poisson distribution. Average offensive support is calculated based on leaguewide goal scoring per game during the NHL regular season, adjusted slightly downward because playoff games are lower-scoring on average. 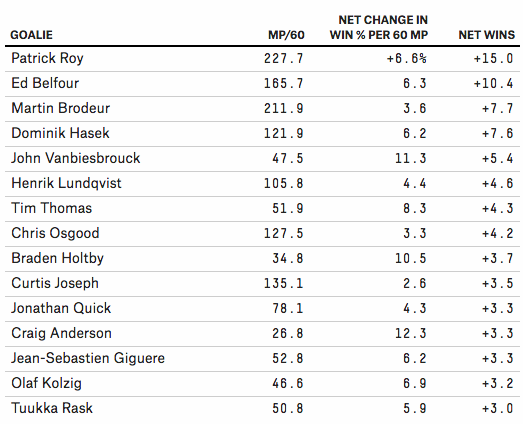 More specifically, Lundqvist is credited with +0.28 wins per 60 minutes of ice time. Since he was actually on the ice for 69 minutes, counting overtime, the number is scaled up proportionately to +0.32 wins. Dominik Hasek, for instance, is credited with playing the equivalent of 8.1 games in the 1994 Sabres-Devils first-round series because one of the games went to four overtimes.